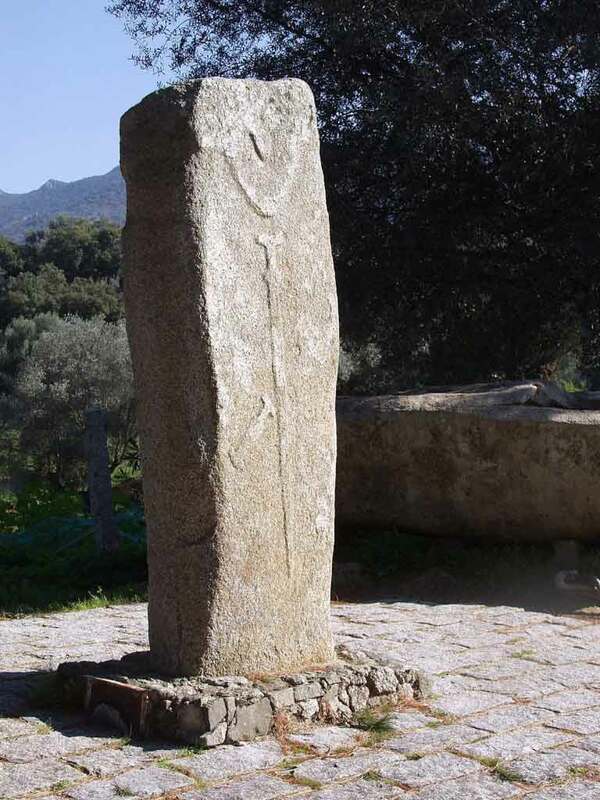 The site offers a unique collection of megalithic monuments, genuine sculptures often with anthropomorphic shapes (human), proofs of the great civilisations that reigned over the island before our time and evoking mysterious religious rites. The function of these voluminous granitic fragments still remains undetermined. However, we know that the menhirs dating back from the 4th millennium B.C. were redesigned around 1200 B.C. Sword, dagger, helmet and armour, the range of details engraved in these “stone men” gives rise to numerous interpretations. Many questions remain regarding the signification to give these menhirs and statue-menhirs. Were the first Neolithic monoliths phallic symbols raised by farmers hoping to fertilise their land? Were they landmarks back when men struggled to keep their territory? 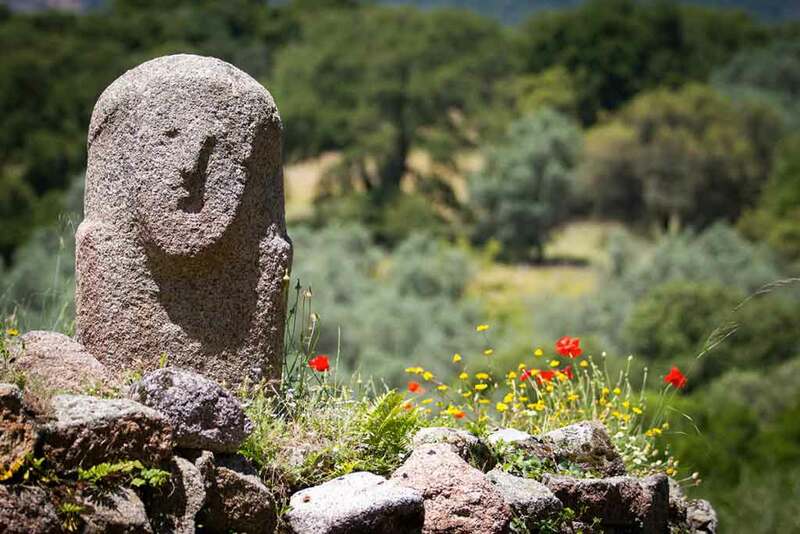 Or were they commemorative monuments for a warrior, a distinctive character or a god? The enigma remains. 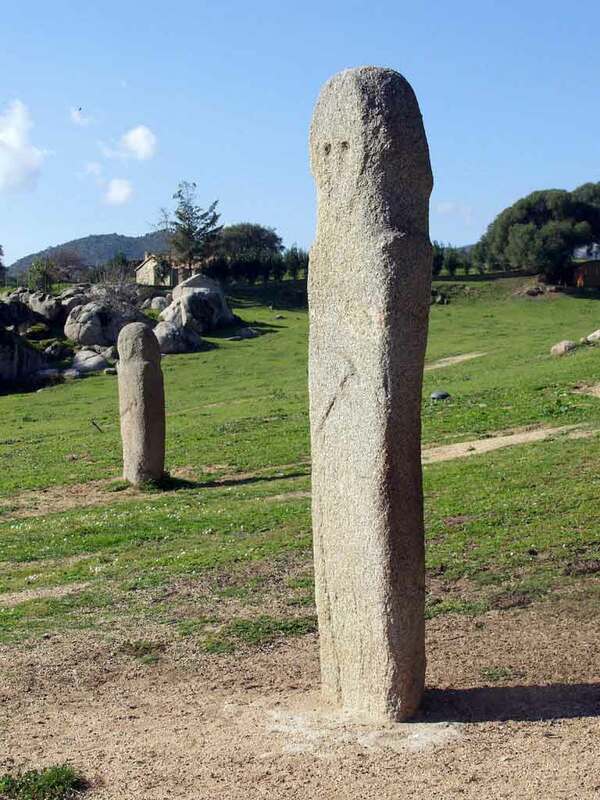 For Roger Grosjean, the CNRS (National Centre for Scientific Research) archaeologist, the statue-menhirs represent the Sherden warriors (“Sea peoples”) allies of the Philistine who attacked and finally became allies of the Pharaonic Egypt between the XIVth and the XIIth centuries B.C. The megalithic sculptors seemed to have preserved in the stone the strength of these warriors. For that matter, the artists took special attention to details. The character is portrayed wearing a hemispheric helmet with an emphasised nape protection. Collarbones and shoulder blades are protected by bulges. Long swords are worn at chest level, suspended on a baldric belt. Daggers are hung sideways on a belt holding a loincloth. Other interpretations are possible. Swords and daggers are symbols of courageous war chiefs, as reported in oral tradition, such as the tradition of the “Paladinu”, Corsican knight protecting the people against thieves and arbitrariness. These statues were painted and even decorated with various objects that were used as ornaments during ceremonies.